Leeco announced the super-slim LeTV U4 TV box at a very good price of $80 only. Leeco just announced its own TV box called LeTV U4 TV Box. It is a flat slim and lightweight Android TV box with a dimension of only 100 x 100 x 10.8 mm with a weight of only 157 grams. So for all the Android TV boxes available in the market, it is one of the thinnest best Android TV box we have seen. The LeTV U4 is powered by the Amlogic S905, 2.0 GHz quad-core processor, which also has a 750MHz Mali-450 GPU. It has also a large processing memory of 2GB SSR3 RAM and comes with two versions of storage, one with 8GB of eMMC storage and other with 16GB of eMMC memory. The TV box also includes a dual-band WLAN and Bluetooth 4.1. It supports the 4K video output resolution and a wide range of video formats and audio encoding. Leeco Android TV box runs on Android 6.0 Marshmallow and comes with EUI 5.8, which is the same as what the company offers in the SuperTV area. 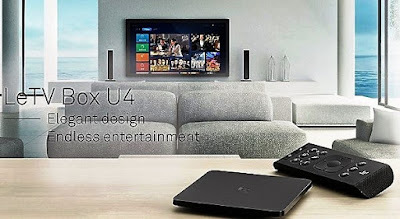 The LeTV U4 Android TV box is currently only available in China. The standard version with an infrared remote control, 8 GB storage capacity and a monthly subscription for the Supersport subscription is set at 299 yuan (about 3,000 Rs). The U4 with infrared remote control, 8GB of storage capacity, a monthly subscription to the Supersport membership and six-month subscription to the large film member begins to 399 yuan (about Rs 4000). Finally, U4 Eco Pro version with Bluetooth, voice control remote, the memory of 16 GB, 1 month of super sports and 12 months Super TV membership costs 499 yuan (about 5,000 rupees).